"Piece of Cake Bakery is the best! Great customer service and excellent product. We chose the Triple Fudge for our wedding as we needed a gluten free, vegan version for our guests. It was so delicious — a honeymoon in a pink box! After almost 30 years together we were finally able to tie the knot thanks to the Supreme Court ruling on gay marriage. The ruling might have happened much sooner had the Justice's known that cake this good would be involved! Cake is political! Support Piece of Cake Bakery, as they support the whole community." "My son lives in Portland, but we live a world away in Israel. For his birthday, we wanted to send him something personal and special. A little googling later, we found Piece of Cake bakery and sent an email asking if it was possible to make a personalized cake and deliver it the same day. Marilyn promptly responded with a yes. When I called on the phone to place the order, she suggested my son's favorite combination chocolate and peanut butter. The cake was perfect, delivered to his house exactly during the window of time that I knew he would be there. My son and his friends said the cake was absolutely delicious! תודה רבה"
On a serious note I had no idea about your bakery except you were on the way to work, or that vegan, and gluten free was an option for a cake. This next part I can not be clear enough. I am the self proclaimed biggest carrot cake snob I know....and if I wasn't trying to get back into shape I would be asking if I could pay rent and place a cot in any back room. The icing on this cake was equally if not better. I typically can not have much icing on any sort of cake, and if I do I am limited to small pieces otherwise I get sick. This has been my truth for as long as I can remember, even my wedding cake I couldn't have more than what was a pathetic crumb to the rest of my guests. YOUR icing (whole cake!) however was worth both dying for, reincarnating and dying again. To sum up in so many words man kind has fallen short of the words needed to do so. Thank you and it is clearly obvious why you guys were voted best in Portland....and every place I have ever had carrot cake. Have a nice day. I'll be ordering soon"
"I just wanted to let you know what a hit the brownie bars and mini cupcakes were at the open house. Everyone raved about them and I let them all know where they could get more ;)"
"I wanted to thank you so much from the bottom of my heart for allowing my husband to come to your bakery to pick up our daughter's special 1st birthday cupcake at 11:00pm on Saturday night, well after you guys had closed your bakery. I had completely forgotten. That day had been so busy for us and I was cleaning the house for our party on Sunday and wrapping presents when I looked up at the clock and realized that I had forgotten to pick up the cupcake! So thank you again. You truly are a sweetheart. We will always remember that. It was the night before our daughter Madilyn's first birthday and we were busy getting the house all ready for the big party on Sunday. I was cleaning the house and wrapping presents for Madilyn and it was getting late. As I had finished wrapping the last present, I looked up at the clock to see what time it was and it said 10:45pm. It suddenly had dawned on me that I had completely forgotten to go pick up Madilyn's cupcake for her party at Piece of Cake! I was supposed to pick it up at 8:00pm. I immediately panicked and said to my husband, "Oh my gosh, I forgot to pick up the cupcake!" He looked at me and we both said to each other, "What time do they close?" So we looked online at their website and saw that they had closed at10:30pm. My husband decided to call the bakery on a whim to see if anyone would answer. After a few rings, a very sweet lady answered the phone and we told her our story about forgetting to pick up the cupcake and how we really needed it for our party the next day. She was so kind and allowed my husband to come by right then to pick it up before she had left the bakery for the night. I had never seen my husband run out of the house so quickly and hop in the car. He arrived at Piece of Cake and they thought our story was too funny. Our daughter loved her cupcake, and the party turned out to be a huge success and was a lot of fun. We will always remember the employees of Piece of Cake and their kindness that night. We will continue to recommend their bakery to all of our friends and family!" "My 12-year old daughter is in the process of doing food allergy testing. Her current off-limit item is gluten. She was to attend a friend's birthday party this past Saturday and wanted to be able to have a yummy treat while everyone else ate the birthday cake. Based on a friend's recommendation we stopped at your store. Even though she was hesitant, we bought her a Red Velvet Gluten Free cupcake. She said it was THE BEST CUPCAKE EVER!!! She said that when she deserves another special treat she'd like to get this cupcake again. I said "what if it's determined you can eat gluten, maybe you want to try something else". She said "NO! THIS is the cupcake I want!"" "With our daughter turning one, and wishing to maintain her dairy-free diet, I did some research on the Internet and found your shop. After purchasing a cake for my colleague's baby shower at work, I was sold! The cake we picked up for Chloe yesterday was absolutely adorable; all our guests oohed- and aahhed! Chloe ate a *huge* piece; she loved it - and our guests (even the skeptics) ate every last crumb. It didn't even get that messy in Chloe's little hands; making cleanup afterward a breeze." Thank you again for a beautiful cake that made our celebration truly special :)"
Thank you so much for your time, your talents, your vision. Thank you for figuring out how we could combine carrot cake and choc cake into a unified whole. Here's your/our cake which everyone loved tremendously!" "I first came across this amazing bakery on my bike last summer (2009). My fiance and I were riding through. Sellwood and I made a mental note about it. Almost 7 months later I finally went it. All I have to say is why did I wait so long? The second time was driving home from cake tasting somewhere else. 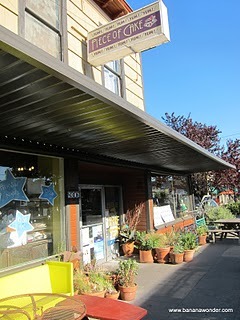 I was very disappointed in the cake from the other place and thought I'd drive through Sellwood and check it out! She gave me a variety of samples and some to take back to my fiance. Marilyn is very upbeat, fast-paced and helpful to work with my requests. Although the wedding cake was out of our budget, I just couldn't get Piece of Cake out of my head. I kept thinking of it. I really wanted our wedding guests to experience this cake. It's VERY moist and more dense that most cake (which I prefer). There are so many flavors and she's continually working on others...meeting and perfecting food needs from people. She offers sugar-free and gluten-free cakes too! If you're looking for a place to get a cake for a birthday or wedding, I strongly encourage you to not waste your time if you want excellent cake. I've been in two other times since then. I just really enjoy the cakes there and she's helpful, friendly and a cake expert! Just wait till you try the Fantasy. WOW!" Can't wait to come in for a cake!!! You were the best of the whole celiac show today. Thank you." "We have a 3 year old son on the spectrum and, since his diagnosis a year ago, we have struggled through a lot of experiments, successful and not so much, with dietary changes to try and improve his gut/digestive symptoms. I just wanted to thank you for devoting so much of your time and efforts to making that process a little easier (and sweeter!) for kids and their parents. It's such a heartbreaking diagnosis to receive and every time you find a resource like your bakery, it seems like such a miracle. Also, of course, the scholarship is incredible because there can never be too many talented, passionate people working to bring our kiddos out of their shells. Thank you for being so generous!" "It took mere days since moving to the neighborhood to become your best customers. Besides Friday night cupcake runs, we have used your bakery to celebrate two major milestones: In June, my sweetheart bought two slices that we ate at Johnson Creek Park just before he proposed, and in December you made us a cake for our 8 person reception. Our tiny cake for our simple legal ceremony was the perfect mix of flavor, beauty and value. Thank you so much for being willing to find something within our budget. Your bakery is worth raving about!" wouldn't consider myself a super picky bride, but I really wanted to see my cake before it showed up at the venue. So I called the bakery and asked if I could stop by to take a peek. When I showed up it was just about closing time and I was greeted warmly and shown my beautiful cake. I was in total awww; it was gorgeous and just how I wanted it. The flavors we picked were Fantasy for the bottom and Marion-berry Poppy-seed for the top. Each of my 60 guests got to taste both flavors and raved about them. Even still 14 months after our wedding when I talk to any of my guests they comment on how good the cake was. Piece of Cake will always be my first choice for cakes! THANK YOU! anniversary cake sometime in July! Banana, please! more. We should've skipped the dinner and gone double on the dessert. Thanks for making it so easy and good." of Cake boasts (and rightfully so) to have the "Best Cake in Portland." They also have a wide selection of vegan and gluten free cakes. AND they have made cakes for Snoop Dog and Marilyn Manson. The cupcakes are not cheap, priced at about $4, but they are unique and fresh. I nearly choked when I saw the flavor "marionberry poppyseed." I am obsessed with both. Now the two combined? Pools of drool. I scanned the other flavors trying to find something for my man. The baker said the Chantilly was their best flavor but I went for the chocolate peanut butter since he digs the pb. I took some quick snap shots outside but we didn't eat these until later that night so the lighting wasn't the best. The marionberry poppyseed cupcake was super fresh and yes, muffin like, which I am in to. The marionberry portion was a simple layer of marionberry preserves. Delicious, however I would have liked to see a higher level of commitment to the berry - such as baking the berries into the batter or a marionberry cream cheese frosting. The cream cheese frosting was pleasantly tangy and thick and not overly cloying. Overall, I was very happy with this cupcake and its unique flavor. The peanut butter chocolate was equally as impressive. The cake was ultra fresh with a robust cocoa flavor. I liked how there was actually a thick layer creamy peanut butter between the cake and frosting as opposed to some whipped up stuff containing 15% peanuts. The chocolate fudge frosting was thick and perfectly sweetened to taste like chocolate, not like sugar. I am not a huge chocolate cake fan, but Piece of Cake could change my mind."